"You never really know the importance of a moment until it becomes a memory". At Gayle’s Framing, we believe we provide a custom framing service and environment that is warm, friendly and individually tailored to your framing requirements. 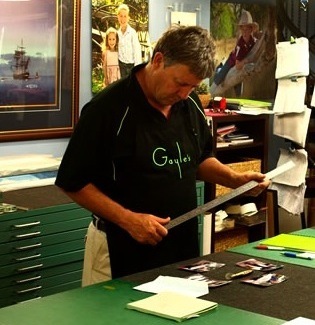 Gayle’s framing is owned and operated by Gayle and Richard Ashton and is centrally located in Toowoomba at 2 Kingston Street on the corner with Gilbert Street in the Mort Estate. Throughout the design consultation you are provided with the most up-to-date advice on the framing process best suited to your object, artwork or piece to be framed. Our products are sourced from around the world and are used to preserve, protect and enhance the object to be framed.